Road Trail Run: Saucony Kinvara 9 Review: At Long Last The K Shoe Returns to Top Form! Saucony Kinvara 9 Review: At Long Last The K Shoe Returns to Top Form! 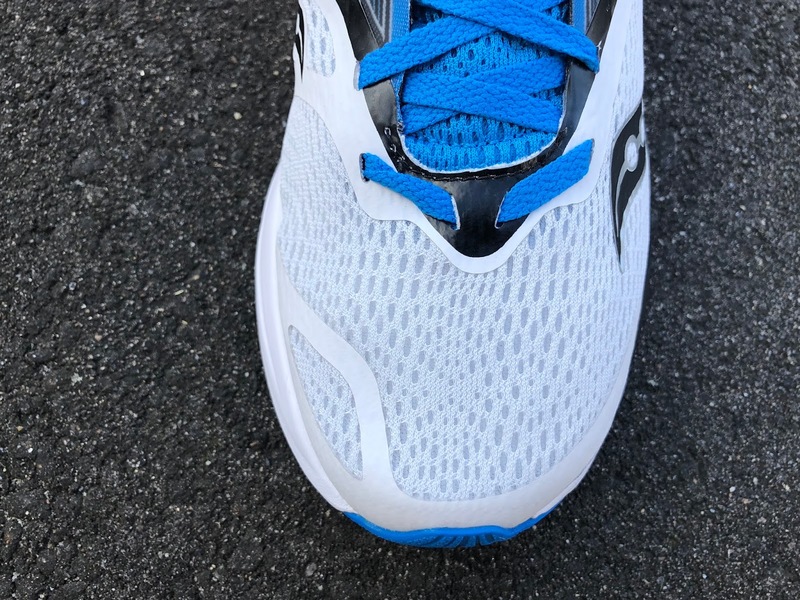 Dave: The Saucony Kinvara is a shoe I have tested through many versions and really, really wanted to like. Over the years, I have loved the aesthetic look, reduced weight, and overall concept of this shoe. Unfortunately, update after update the Kinvara did the same exact thing o me-It tortured my achilles and heel bone. The hard heel collar inflamed my heel bone and caused a calcaneal spur. That, combined with the softness or too much firmness in the ride of Kinvara over the years, always changing, from version to version, just created an unpleasant experience. Note: I last ran in the K7. Well, all that seems to have changed! I am absolutely in love with the Kinvara 9! Yes, the heel collar is causing a bit of an issue again (I struggle with all hard heel collars), but this time it is not pulling into my achilles. The fit is outstanding via the rubberized Pro-Lock system in the middle of the “throat” of the shoe, I have a great locked and loaded fit when laced up. My size 9 does run a hair small, but I like wearing my shoes on the smaller side (years of track spikes) - - If you are looking for a bit more wiggle room, I’d suggest going up a half size. Peter: I really enjoyed the first couple of Kinvaras (Kinvarae?). Somewhere around 4 they lost me and I could barely muster up the enthusiasm to run in the 8, so I came into the Kinvara 9 with pretty low expectations. There are so many shoes out there that have delivered on the recipe that the early Kinvara established--light, relatively highly cushioned, and somewhat minimal. How was the Kinvara going to keep up with the many shoes it had inspired? I agree with Dave, it seems like they’re back on course with this shoe. The fit is a tiny bit snug, but in a good way. I didn’t have any rubbing or blistering, just a very nicely fitting shoe. These are one of the rare modern shoes that actually seems to need a little break in. They felt a bit too stiff on first run, but have opened up as the miles piled up. 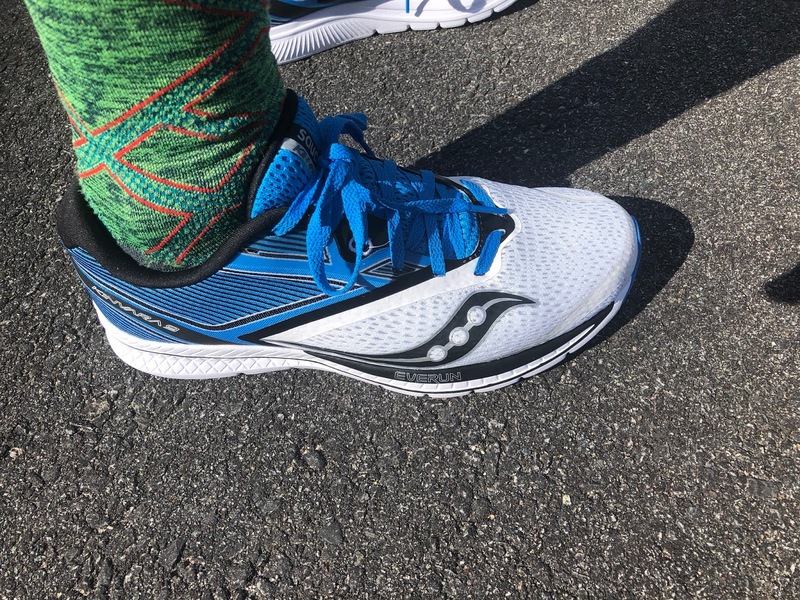 Sam: I have not really enjoyed a Kinvara until.. The early groundbreaking models, really the first low drop (4mm) very light and minimal shoe from a major company, were overly “natural” for me, not enough upper structure and overly flexible, The Kinvara 7 was a pretty darn good shoe but stiff and with an awkward overly constraining upper, all a sharp contrast to the early models. The Kinvara 8 while improving on the 7’s upper and regaining flexibility was overly soft underfoot at the heel and not lively. 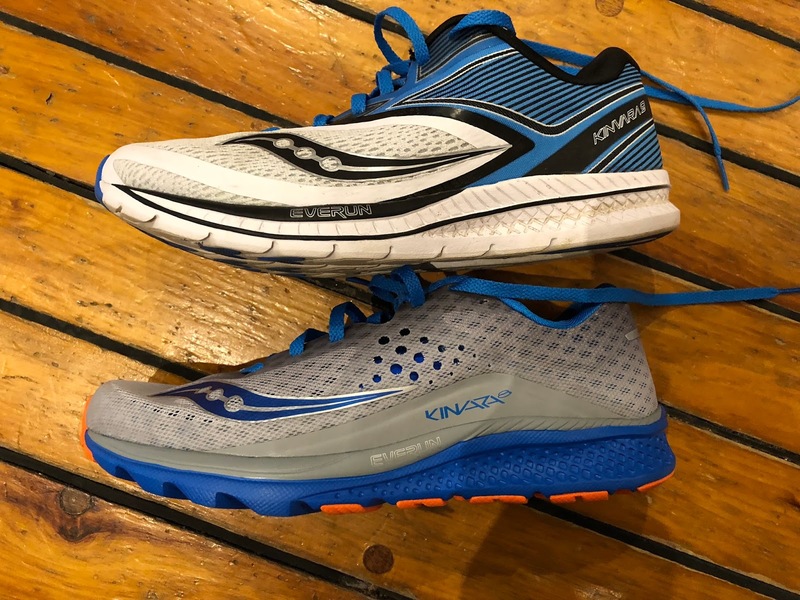 Well with the Kinvara 9 Saucony has really brought the K shoe forward with nods to its "natural" ride through its flexibility and light weight but with upper support and under foot performance now more central to the recipe. The upper is much improved in comfort but is clearly a performance type fit initially, retaining the Pro-Lock strap which now is thinner and more pliable and is actually useful and effective given the soft engineered mesh upper. Pro-Lock is no longer a literal pain as in the past. Underfoot, the ride is lively and relatively firm, just right by me, but also well cushioned particularly in the forefoot. The fit is true to size, if a bit short and low way up front initially but stretched nicely with some use. After some miles, 30 or so, the fit relaxed considerably as the soft mesh stretched but the hold is still secure becoming a very secure slipper like fit and feel. Kind of neat! I wondered at first try on if they were going to work as they were snug and seemingly low volume over the midfoot. Barely through my first 5 miler, I noticed that the fit improved and quite dramatically. The sockliner packed down? Pro-Lock strap and upper stretched a bit? The soft mesh makes the relatively snug fit, truly foot conforming, in a sharp contrast to the stiff flat mesh of the Kivnara 8 which had little give. This is a shoe that doesn’t need to be laced overly tight for a good foot hold given the Pro-Lock strap. I agree with Peter, the first run they were stiff but after 10 miles became very flexible. Dave: Boasting a new more substantial upper than the Kinvara 8, which also increases breathability, the K9 fits me pretty well. The toe box is a bit jammed, which unless you like a snug fit, this is why I would say to go up a half size. Wider footed runners may struggle with the upper on the K9 as it really seems to at least me, to have a narrow fit. That being said, I love the update and it molds extremely well, making this be a great race shoe if you wanted it to be. Peter: I think the K9 has an exceptionally well designed upper. There are some great features that help assure a great fit. The tongue--which looks like it’s slightly too short every time I go to put the shoe on but then is just fine--has a perfect amount of padding. Saucony FINALLY made the Pro-Lock system an integral and useful part of the lacing system. This is by far the best implementation of the Pro-Lock system. You can really fine tune the midfoot lock by making-micro adjustments on the Pro-Lock. At first I was afraid the K9 was too narrow, but with a little bit of fiddling with pro-lock I got the mid-oot to give a bit and had a great fit. The mesh up front is super breathable. I still prefer a great engineered mesh like the one on the Saucony K9 to a knit upper. The ankle collar has nice padding and the foot is held really well inside the new woven heel cup. The upper is finished off with sleek flex-film overlays. It’s great looking and all works together to function beautifully. Sam: I will agree with Dave and Peter that this is an outstanding upper if somewhat narrow. The upper is foot conforming, soft, well held and secure. Those with higher volume feet may have a better chance in this upper, unlike the last few versions if a snug fit is your preference, and by potentially sizing up a half size. Saucony wisely brought back a few overlays to hold things together up front given the soft mesh. At midfoot the Pro Lock strap is notably thinner and more pliable than in the K8 and does its job of stabilizing and locking the foot to the platform without bothering as it did before. Further the strangely placed substantial lateral gray overlay of the K8 is removed, replaced by thin pliable overlays. For sure, I can feel the extra room where foot meets sockliner as now the foot can expand a bit in that area and as said before the Pro-Lock is thinner and more pliable as well. More importantly given this change the flex of the upper and the foot is now longer and smoother as a result of the overlays removal and the softer mesh overall, harkening back to the original K shoes. The tongue loses the “puff” of the K8 and works perfectly in conjunction with the laces and Pro-Lock. 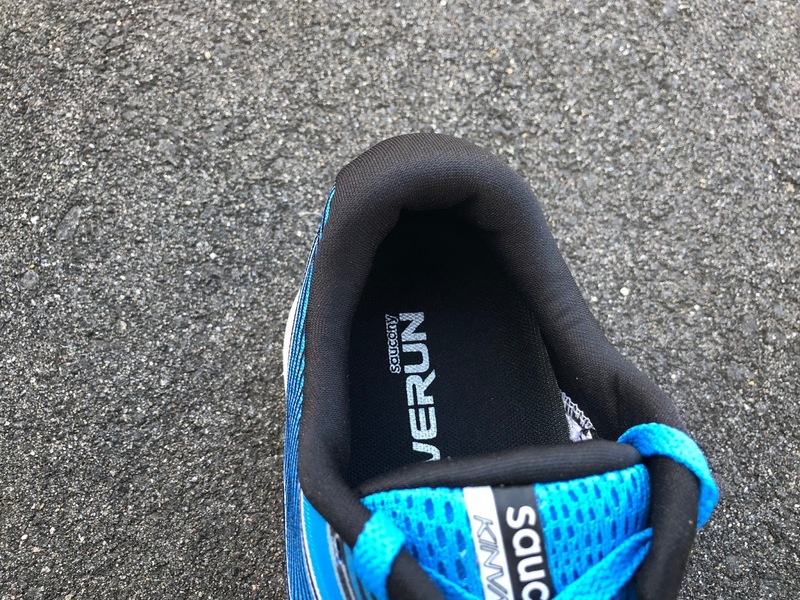 I found this is a very easy shoe to lace and go after the first snug run, and one that does not require over tightening which I found can lead to a bit more pressure from the Pro-Lock strap. Sam: The K9 retains the EVA+ midsole and EVERUN topsole of the K8 but here due to visible changes in the midsole geometry and what feels upon pressing as slightly firmer foam we have a vastly improved feel and ride which is dynamic, fairly firm yet well cushioned and flexible. The K8 was overly soft for me especially at the heel, the K7 was very firm and stiff. 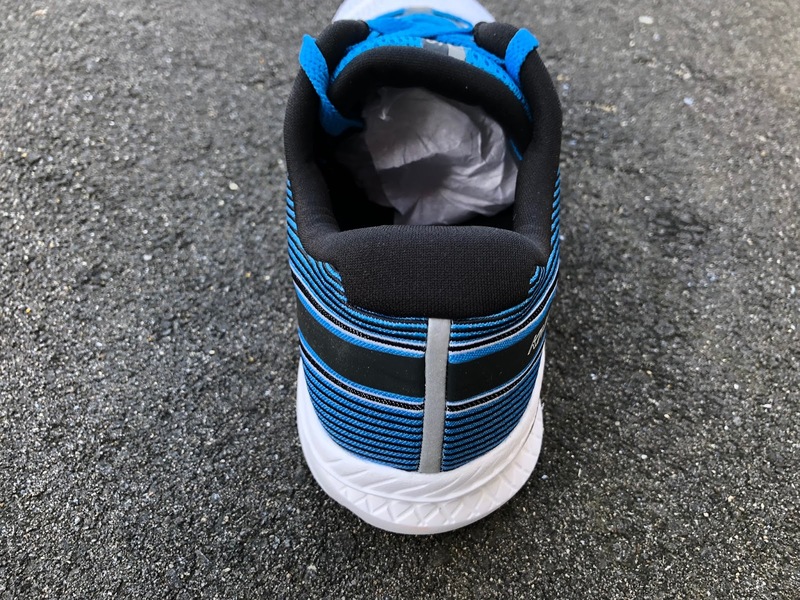 The midsole underneath now has two deep longitudinal grooves for flexibility and moves to 3 zones of forefoot contact from the Tri-Flex outsole for I think a fuller, more stable and responsive ground contact. There is also a change to the heel geometry making it less concave right at the outsole so less compression on heel strike yet with also less outsole rubber thickness (and durability..?) to keep things from getting harsh. As with prior Kinvara the midsole platform is wide and the medial side walls vertical which gives the shoe some inherent stability at mid foot. so those who prefer some pronation control might find it to be a good race shoe option. Personally I would prefer a bit more of a sculpted less vertical medial side wall as I actually found the support under foot on that side a bit much interrupting the transition to that smooth forward flex a bit at pace. At slower paces daily training and in the later stages of a marathon I would certainly appreciate it! 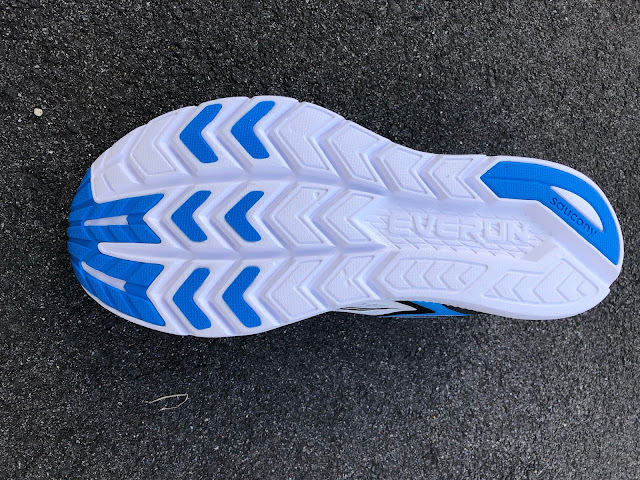 So in summary without changing the basics of EVA+ and EVERUN Saucony has produced a significantly better overall midsole and ride. Dave: Through the use of new EVERUN in the topsole and EVA+ in the rest of the midsole, this baby can flat out fly! EVERUN is definitely one of the best midsole materials out there right now and can rival the stuff Nike (Zoom X), Skechers Performance (FlightGen) Altra (A-Bound) and Brooks (BioMogoDNA) are putting out there in the run industry right now. The combination of EVERUN and EVA+ produces a very, very smooth heel to toe transition, making mile after mile effortless, however when you get to your mid load position and about to transition into your forefoot, the EVERUN begins to shine. There is a huge sense of pop off of the forefoot and the snappiness is abundant! I seek this in every single shoe I ever review, and Saucony put it perfectly where I like it. It’s the bread and butter of how a forefoot should respond at toe off in my opinion. So, so good! Peter: Prior to the K9 I have been pretty underwhelmed by Everun. It just hasn’t felt that responsive OR cushioned to me. The K9 finally incorporates the Everun in way that creates some symbiotic harmony with the upper and the outsole. While the K9 feels pretty cushioned over the length of a run, it’s not particularly soft at any point in the run. Suffice to say that it’s cushioned, but not cushy. There are no dead spots in the forefoot here (a problem I had with the Freedom and the Liberty and to some degree the Nike Epic React). As Dave mentioned above, the Kinvara 9 just pops off of the forefoot. It’s fine at slow speeds and really livens up as you go faster. Sam: The outsole as with all Kinvara is mostly midsole. The new longitudinal flex grooves make a huge positive difference in how the shoe runs giving it a very fluid any pace transition. As noted above, there is a bit less heel rubber. The forefoot now has Tri Flex patches all the way across to the lateral side which the K8 did not have. I do worry a bit about the removal of the lateral outsole. 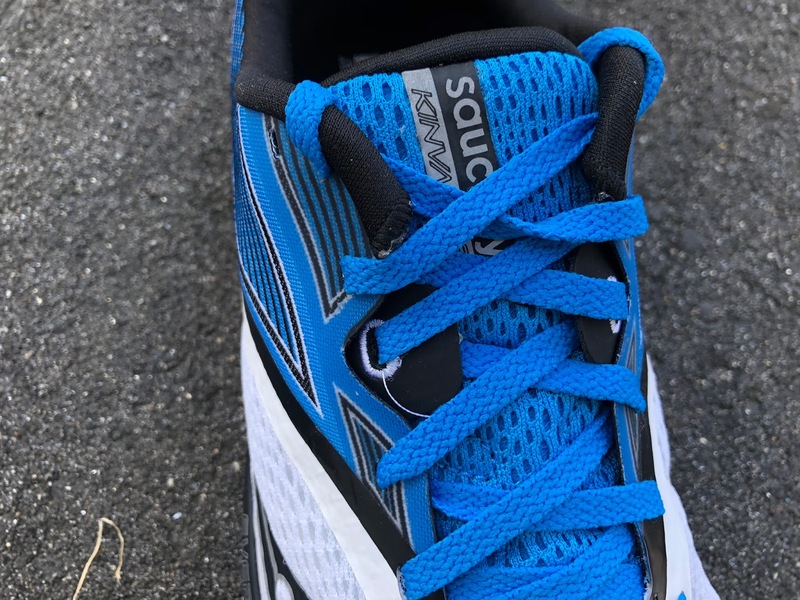 Overall the K shoe does not have a lot of rubber and while the minimal rubber contributes to the super light weight for the cushion and ride, durability likely won’t be up there but that is part of the trade off for the light weight, flexibility and dynamic ride. Dave: The Kinvara has struggled over the years with durability issues. For me, it was always in the 200 mile range. Again, and I think we overlook durability in regards to a runner's gait, weight, etc, this K9 update should last a bit longer. It seems the K9 has addressed some of these issues by providing a re-tooled outsole, with added flex grooves to allow smooth transition so less potential scuffing and potentially increased longevity of the shoe. I think that if you were to exclusively make this a training shoe, you may need 2 or 3 pairs for a marathon cycle if you are a runner logging say 50+ miles a week. Again, to each his or her own. The ride of it alone will make you want to keep coming back, mile after mile, therefore you may need an extra pair or two. 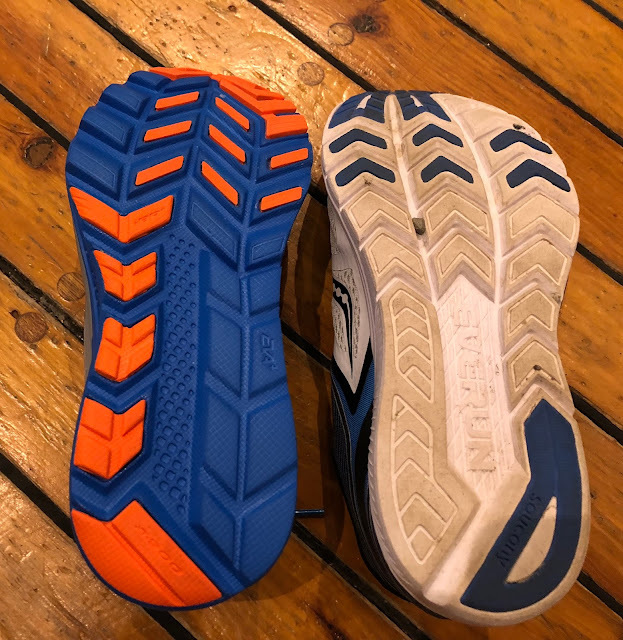 Peter: Where the K8 felt stiff and brick-ish, the K9 feels more flexible (thanks to deeper flex grooves and less rubber on the bottom) and more fun to run in. 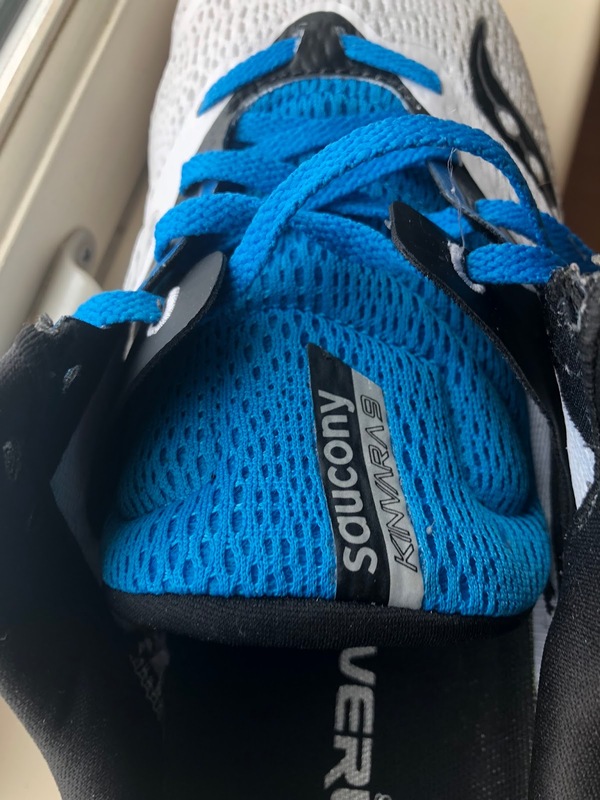 It seems like Saucony decreased the amount of blown rubber on the lateral part of the foot, which helps with flexibility. As I mentioned above it took a few runs for me to feel these loosen up a bit, but wear is pretty minimal so far. Dave: The Kinvara 9 is one of the best shoes I’ve run in so far in 2018. It’s easily in my Top 5 of Spring 2018 (Rankings coming via RTR soon!) and it’s currently going to be rotated heavily with the Skechers Performance Ride 7, which is my current fave! The K9 is smooth, snappy, vibrant and makes your running effortless. While it is labeled as a light performance trainer, don’t hesitate to just plain run in this shoe. Like, just run. Easy days honestly feel great. If you want to crank it up it really shines for tempo days, Fartleks and can be used on long runs with some MRP work in it. I will not be afraid to throw it out there that the K9 can make a great marathon racing flat. It’s energetic and exactly what I like on my feet for the long haul. Peter: With the caveat that it feels a bit stiff in the first few runs, this is a great riding shoe. The upper and midsole work together to hold the foot really, really perfectly. The shoe disappears on the foot and you can just run in it. I agree with Dave that this is a great shoe at any pace. It falls into the swiss army knife category for me. I wouldn’t hesitate to take it out on a slow 20 miler, a medium fartlek session or a longer race. I’m hoping it breaks in even more and continues to get smoother. Sam: The KInvara 9 has a fabulous, any pace ride. It has enough cushion for any distance and with its responsive midsole and its flexibility it can handle slow pace transitions as well as up tempo. It's a rare double, a very light “performance” oriented shoe which can race or train. The midsole is just firm enough, the outsole just thin enough that the ride bridges response and cushion brilliantly with no overly soft bottoming out as K8 had, and without the stiffness and harshness on landing of the K7. Dave: In all, an outstanding job by the product development team at Saucony to bring back to life a shoe that in my opinion somewhat lost its way over the past few years. Recommended for the runner looking for a fast shoe, but also the runner looking for something to just cruise some effortless miles in the middle of the week. It’s built strong enough for the long run and like I said above, I may think about racing my next Full Mary in it! For the runner looking for a lightweight option in the shoe rotation this should definitely be added, especially if you are a fan of vibrant midsoles. EVERUN is certainly the real deal. Peter: A return to form for the Kinvara. I’m not as enamoured of the K9 as I am of the Skechers Ride 7, but it’s a different ride. It’s a bit firmer than the Ride 7. The K9 works well at any speed, looks good and will be a great workhorse. Agreed that it’s one of the more fun shoes of the year so far--and running should be fun, right? Right? 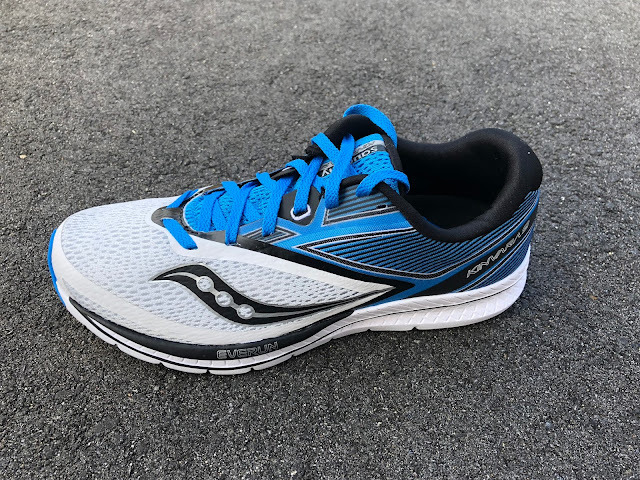 Sam: Kinvara 9 is one of the best shoes of 2018 and is an outstanding update. Other than potential outsole durability concerns, K9 has tremendous pace range and comfort in a very light weight package. It can be a daily trainer, performance trainer, and for sure a fabulous longer race shoe. Yes, it is on the snugger, narrower side, but the new soft mesh upper and Pro-Lock modifications keep the comfort for daily use in the realm of just fine and up tempo and race really fine. So unless you want an unstructured “slipper” where most often performance will suffer, or have a very wide high volume foot, the K9’s fit is where it should be in such a shoe. I particularly appreciated the combination of comfortable upper support, under foot stability-if a bit overdone for my tastes, great flexibility, the dynamic ride and smooth any pace transitions. If you are seeking a light do it all shoe with a low drop the K9 is a delight to run, a big smiles shoe and is highly recommended. -0.15 for outsole durability concerns. A few fractions of an oz of additional rubber would be good. -0.1 for somewhat short and low upfront. The toe bumper could potentially be stiffened a bit to raise the fit. Dave: The K7 was my last Kinvara, as I skipped the 8, thinking I wasn’t going to see a change. By far, the K9 is the best Kinvara ever built. It’s extremely responsive and seems to be built for the long haul (at least better than previous versions) The K7 shredded my achilles and lacked the key flex grooves in order to give me a smooth heel to toe transition and pop off of the forefoot I like. Sam: The Kinvara 7 was a fine fast shoe but it had a quite frankly painful upper which was very snug and made snugger by the massive Pro-Lock which even had a cross piece. It was super stiff and quite firm. K9 resolves all the of the issues of K7 for me. Kinvara 8 on the other hand was soft at the heel for me and was not a very lively shoe. It did regain some flexibility. K9 puts the snap back in the ride, is flexible and improves the upper significantly. Version 9 is by far the best K shoe for me to date. Sam: Same company, Everun in the mix but completely different rides and fits. The full Everun midsole in the Freedom is bouncy, somewhat sloppy and lively, overly so for serious daily running or even racing for me. The Freedom upper is snug but lacks support over the soft underfoot platform. 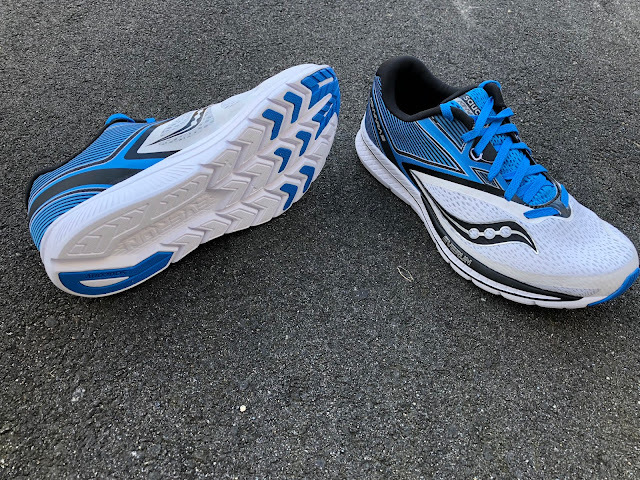 So we have a wild ride in the Freedom and a fun one but for training or racing I much prefer the lighter, steadier, more responsive and evenly cushioned K9. As for the Liberty ISO same as the above but with a bit more support and stability. Dave: Easily two of the best shoes to debut in the early stages of 2018. This is an extremely tough call, but the edge goes to the Ride 7. FlightGen is just a touch more lively than EVERUN and the M Strike technology in Skechers Performance just really hits home with me when I step down on the gas. However, don’t count out the K9. I personally just want both in my rotation and will keep it that way! Sam: The Ride 7 has a superior no compromises upper which is clearly roomier. It is not as stable or responsive under foot as the K9 but does have a softer, livelier bounce and more cushion from its higher stack. While the Ride 7 is a great shoe, I prefer the stability and lively responsiveness of the K9 and bonus, it is close to 2 oz lighter. Peter: Ride 7 still top dog for shoe of the year for me. K9 is definitely firmer and has a different feeling ride, but the Ride 7 is a little more comfortable and just bounces off the pavement for me. Dave: I can’t run in the Run 6. A sloppy upper and a underfoot that is far too soft, the K9 gets the easy win for me. Upper wise, the Run 6 trumps the K9 upper, but it’s too sloppy on my foot and is worn casually. Sam: Generally concur with Dave here. The Run 6 weighs 0.4 oz less and has less overall stack. Its midsole seems softer so I tend to bottom out in them and don’t get the lively response of the K9. The K6 stretch knit upper is super comfortable but just isn’t enough for serious well supported running as the K9’s upper delivers. Sam: The considerably heavier and somewhat more cushioned Launch has plenty of durable outsole rubber that the K9 lacks. Launch 5's new fabric like engineered mesh upper with no overlays at all does not match the narrow mid foot midsole platform. It is unstable at speed and on curves. It has a bootie as the K9 has but no Pro-Lock or underlays and either or both are sorely lacking as the middle of the foot support in the Launch at pace is inadequate while in the K9 it may actually be a bit over done. I also prefer the liviler, smoother transitioning ride of the K9. K9 the clear winner for me. Peter: I prefer the K9 from the upper to the ride here. The Launch remains stiff after many runs, while the K9 is breaking in more and more. Smoother and more enjoyable ride for the K9. Dave: These both have that lively snappy feel. They both want to go fast, but when dialed back for an easy day, keep your stride nice and smooth. I like the narrower overall last of the Razor 2, but I’m not sure it pops as much as the Ride 7, and the K9 pops like the Ride 7. So to clear all of this confusion, the Kinvara 9 beats out the Razor 2. Sam: I am with Dave here. The Razor has a great upper but its midsole is overly firm for me. It lacks the pop and smoothness at all paces of the K9. Peter: For shorter races (up to and including 13.1) I’d go Razor 2 in a heartbeat. The upper fits me a little better on the Razor 2 and it is FAST. The K9 would be a longer run or Marathon racer for me. Dave: To me, not really a comparison because I think the K9 now enters a more daily trainer category, that’s just really lightweight. The ZE9 is a workout shoe for me and when reaching to the never ending mountain of shoes in my place, the ZE9 is just plain faster. I wouldn’t take the K9 on the track and I will with the ZE9. That seals the deal for me. Peter: K9 trainer, long race day shoe. ZE9 is a faster shoe that can go long. Different shoes. If I had to choose 1 it would be the ZE9. Sam: All the buzz these days the flashy attractive Epic React just doesn’t make me smile other than at its looks. Its upper is similarly snug to the K9 and also with some use will stretch. Underfoot the K9 ride is far more pleasant and lively for me. The Epic React is more cushioned but somehow lacking a bit of soul. The K9 has a longer easier flex which is something I especially like in a trainer. Peter: I ran these back-to-back today. On step in, the Epic react is MUCH more comfortable and cushy. When I run in it though I feel like I lose just a bit of energy in the forefoot landing and take-off. I want to love it, but I just like it a lot. The K9 pops off the toe more and is more fun for me to run in. Peter: This is an unfair comparison. I love the NB 1400 V5 so damn much that very few shoes can compare. It’s blazing fast race shoe that I can run any distance in. The ride of the K9 is a bit firmer, though a bit more cushioned--if that makes any sense. I prefer the 1400 v5, but I’m glad I have both of them. Sam: Both shoes have similar more “natural” ride intents and feel. The 6mm drop Pro comes in at 8.3 oz so 0.7 oz more than K9 has a roomier yet well held upper and tons of durable outsole rubber, likely most of the weight difference. The Pro is slightly more cushioned particularly at the heel with its Vibe insert. The Pro transitions almost as well at all paces but has, despite its outsole rubber, less pop than the K9 with a slightly more easy going ride. Pro would be a good choice if you want a light long lasting daily trainer with some racing capabilities with the K9 a better choice for up tempo and racing. Peter: I found the RA Pro to be really tight in the toe-box--causing irritation on both sides of my feet. The ride of these is pretty similar, but so far I like the K9 better. The Kinvara was provided at no cost. The opinions herein are entirely the authors'. Please compare adidas Boston 6, Skechers ride 7, Kinvara 9 at all paces (faster, slower tempo) ? Do you feel that the toebox is more narrow than that of Kinvara 8? Thanks for your question. It is a difficult one as we all run differently and in addition to pace one has to consider distance at those paces. 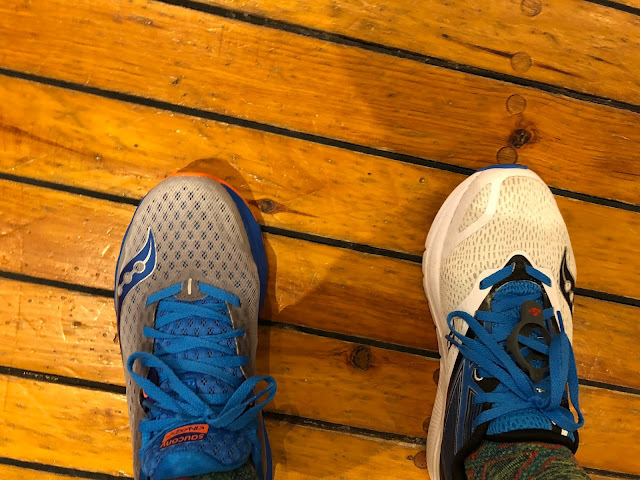 The key difference between the Kinvara and the Ride compared to the Boston for me is the Boston's thinner firmer forefoot and Ride 7's softer yet very well cushioned less stable forefoot. 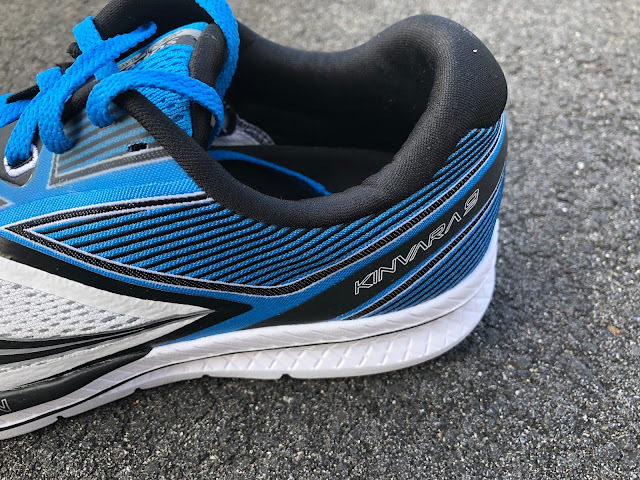 As distance, and pace increases I think the Kinvara will be my preference as in addition to its stable substantial forefoot cushion it has the most supportive upper, although one that is not as comfortable as the Ride.It is also inherently very stable. The Boston fits right in the middle. Its higher drop than the other 2 is an advantage for me when tired but its thinner forefoot can get tiring. The Ride has the most comfort and most cushion and is the liveliest at all paces but is the least stable. 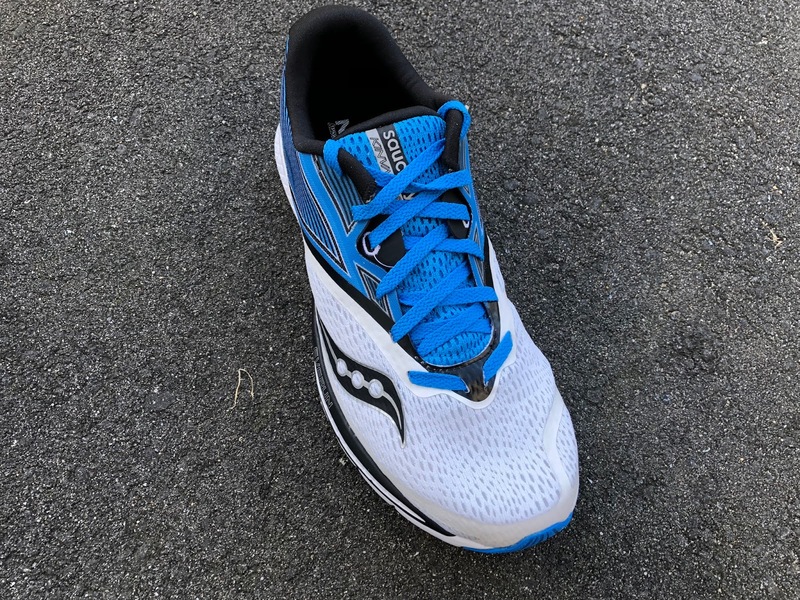 As far as which is fastest overall hard to say but the Kinvara is the lightest and for me, the most smoothly responsive at all paces and firmest so personally I would say it is the fastest. Okay - I am so torn now! I was actually considering the Hoka Mach because I have enjoyed the Clayton 2 and am looking for something with some good forefoot cushioning/support. How would you say the 9's compare with the Mach? Thank you! Thanks for the review! How does K9 compare to Zealot 3? Ravenna would be slightly wider in the D width. I see it also available in 2E wide. Hi guys, great review. Coming from Asics ds trainers and racers, Adidas Boston's I really liked the Kinvara 7 and 8. I will definitely try the 9. I also just ordered the NB 1400V5 after many happy km's in the 1400V4. I currently also have the Adidas Boston Boost 6 in my shoe rotation and I have to say, the Kinvara's are a lot more stable. Otherwise, they are similar kind of shoes (light race/traing shoe). I am am fairly new to RTR and the reviews are excellent. What I also like is you do road AND trail shoes. So, I really appreciate the time and effort you put in this great website to help us road and trailrunners. Thanks so much for reading and commenting! We work very hard at RTR and wouldn't do it if we didn't love to run roads and trails so the team appreciates your kind words. I think given your shoe preferences that you will really like the K9. I just ran 7 miles in mine this morning and they were perfect on an indoor track with sharp corners. Would you say it’s better o go with the K9 or Sketchers Ride 7 on the Marathon? Tough question. What are you training in now? 1st instinct would be to say Ride for training and Kinvara for the race. What is your goal time? I am training my long runs with a Nike Vomero 12, but In hink it’s heavy. Also I changed the way I run sometime ago, now more of a middle to forefoot runner and the vomero just doesn’t seem to help me much on this type of running, maybe it is the drop? 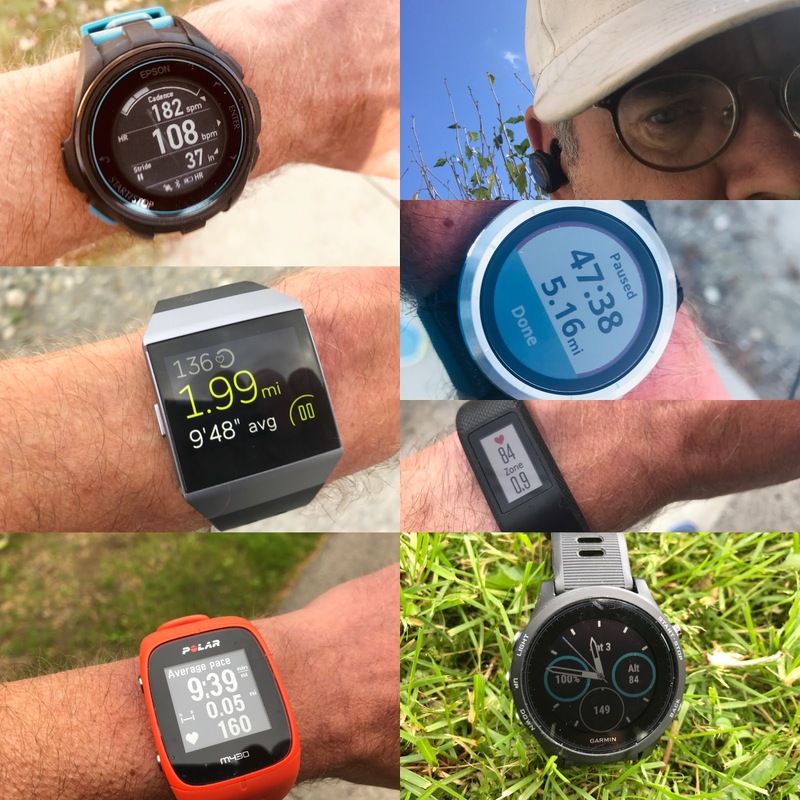 I did a half marathon two weeks ago with a Nike Elite 9, that’s the one I use for tempo runs, it was great, but felt my forefoot a bit beaten at the end of the race, not sure if I would stand a full marathon with it, but still it’s way better than the vomero. My tempo in the half marathon was 1:47, I think with the proper training I will be able to do less than 4 hours for the marathon (never ran so far). I mix some trainings with the Kinvara to get used to it before the run? I try to keep at least 3 runs per week, a long run, a 10k run and a fast tempo,run mixing different paces (the fun run). I was thinking on buying a more minimalist shoe like a Streak LT4 or Sketchers Meb Speed for the fast tempo. Could use the Kinvara in the 10ks to get used to it. How does the sizing compare to the 8's? If I had an 8.5 in the Kinvara 8's, would I be safe with the same size for the 9's? Thanks! Kinvara 9 , Hoka Clayton 2 or Hoka Mach? How would you compare the K9 to the Altra Escalante? 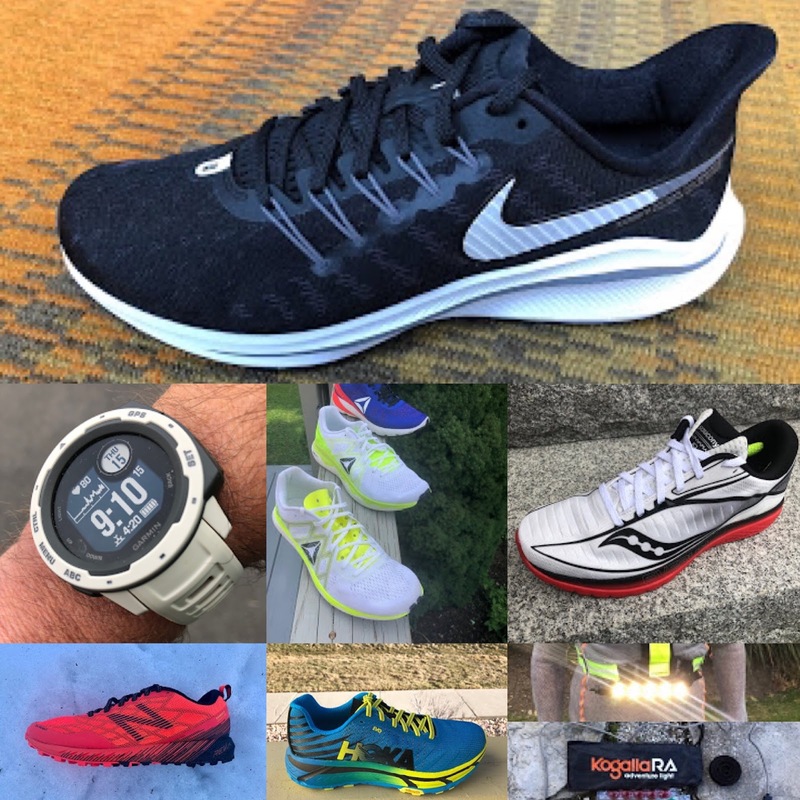 As a daily trainer for quite high mileage runner (~100k/week), as far as versatility goes (cool runs, some tempo, track...off road ability, durability)? Both are fun! The Escalante has more bounce with the K9 a steadier dynamic feel. As far as durability the Escalante clearly has more rubber. Off road on mild trails with no big traction requirements I would lean towards the Escalante. Tempo and track a toss up based on preferences both should be equally fine. Longer runs clearly the K9 for me as while the zero drop is no issue for me I prefer some drop. Upper clear winner for me the K9. Hope this helps. I appreciate the in depth reviews! Any suggestion between the K9 and the Zoom Fly for racing marathon around a 3:00:00 to 3:05:00 pace? Thanks for writing! I am old 61 and slow a nice 3:40 this Sunday but do run halves 1:35-1:37. I would definitely pick Kinvara over Zoom Fly which I found stiff and harsher than I would want for a full. Kinvara is light, stable, and nicely responsive But what you really want for that marathon might be VaporFly with Kinvara more for up tempo training in the rotation. Truly amazing shoe. Hi guys - firstly the site is fantastic and your reviews are the best I’ve seen on the web, and I love a good review! I’m running the Berlin marathon in September. I’ve been training in the ride 7 (brilliant) and I’m looking for a good, fast, slightly cushioned, lightweight race shoe. I’ve been running in the zoom elites but wouldn’t want to go beyond a half marathon in them. I’ve also got a pair of the reebok floatride run fasts which are great to run but I’ve had real issues with blisters. 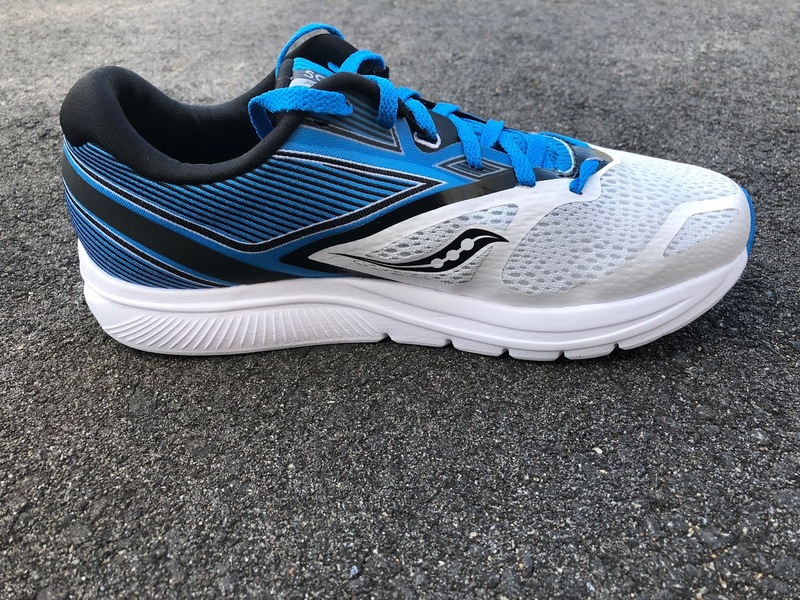 Could the saucony k9 compete with the the floatrides over a marathon? What else would you consider? I’m targeting 3hrs for the race. ^ sorry didn’t publish my name re Berlin marathon - Ollie! Thanks for kind words about RTR. Much appreciated! First would tend to agree about Zoom Elite. I found the heel soft and it is a shoe which favors a consistent mid to forefoot strike and as the km pile on almost nobody maintains such as stride. What and where are your blister issues with the Floatride Run Fast? How did you size compared to others and have you tried different socks? The K9 would be an excellent marathon choice. It is quite broad on the ground under foot and stable for those later miles. Another in the same class and similar in design with exposed midsole the NB Fresh Foam Beacon review of which you will find at the link below. Of course if you could find a pair in your size the Vapor Fly would be ideal for Berlin's flat fast course. Suggest staying away from Zoom Fly. Reebok blister issues are at the widest point on the forefoot. Two layer socks have mitigated it on 10 mile and under runs, but I can still feel heat there so have concerns re. full distance. I’m a 9.5 with a high arch so vary between that and 10. I went with a 10 in the reeboks. I was surprised as haven’t read about fit issues but the upper is very slippery and I think this exacerbates rub. First of all thanks for the great work that you are doing here at RTR! I'm training for my first marathon right now. Running 3-4 times a week. A track session, a fast paced ~10k, a long run and an optional 10k recovery run. For long and recovery i'm using a Ravenna 9 (which i love) and thats probably the one i will go for in my first 42.2. For the faster workouts i tried a Boston 6 at First, which was far to unstable for my amount of pronation. Then i switched to Asics DS Trainer 23 (for the support). Those seemed to work for me in the beginning, but are now causing some serious knee pain after running in them for -200km. I'm thinking to replace them with a) K9 b) Razor 2 c) Forza 3 or d) Brooks purecadence 7 (Maybe to heavy? But sticking with Brooks seems like a good idea). Any suggestionens for me? Thanks for kind words. Seems like you like a bit but not to much midsole support. The K9 would fit the bill understanding it likely won't last 100's and 100's of km unless you are very light. Razor 2 is firmer and for me not really a training shoe, Forza 3 is also on the firm side and could work as Ravenna does. Also look at Asics Cumulus 20 and Salomon Sonic RA or RA Max, mostly neutral but plenty of support. Thanks for your help! The Sonic RA looks really promising. But i'll probably try the K9, since i'm leaning towards a lower drop shoe at the moment. I've recently read "Born to run" and like the idea to improve my running form and maybe develop a more natural stride with the help of a lower drop shoe (after my marathon). Sounds like the Kinvara could be the right shoe for that. What do you think? "Born to Run" is a great book. As the dust settled on all the changes in running shoes resulting it is clear that mixing some lower drop shoes with higher drop is a good idea. For me lower drop is less about form that working different muscles and tendons. I run in everything from zero (occasionally) to 12mm (occasionally) with my sweet spot 6-8mm. As far as lower drop and form. The latest from Altra Founder Golden Harper, a master of form having taught over 1000 classes and of course developed Altra's Zero Drop shoes is to focus on arm carriage. It will have more of an impact on form than anything else according to him. Basically upright shoulders with slight lean forward at the hips, compact arm carriage with hands never in front of the knees (reaching forward with arms leads to overstraining) or swinging wildly. Hope this helps. I've been looking into getting a new pair of trainers and have heard good things about the Kinvara 9s. I'm currently running in a pair of Brooks Adrenaline GTS 17s. The Adrenalines have worked well for me for the most part but I consistently get bloody and blistered toes on my longer runs. I'd like to make the switch to something else (preferably something with a lower mm drop). When I was fitted for shoes a couple of years ago, I was told the I pronate and was recommended various stability shoes. Do you think the Kinvara 9s or the Sketchers GoRun Ride 7s would fit the bill for what I need? I'm averaging around 35 mpw and am looking to bump that up to mid 40s soon. I run on both road, park paths and non technical trails. 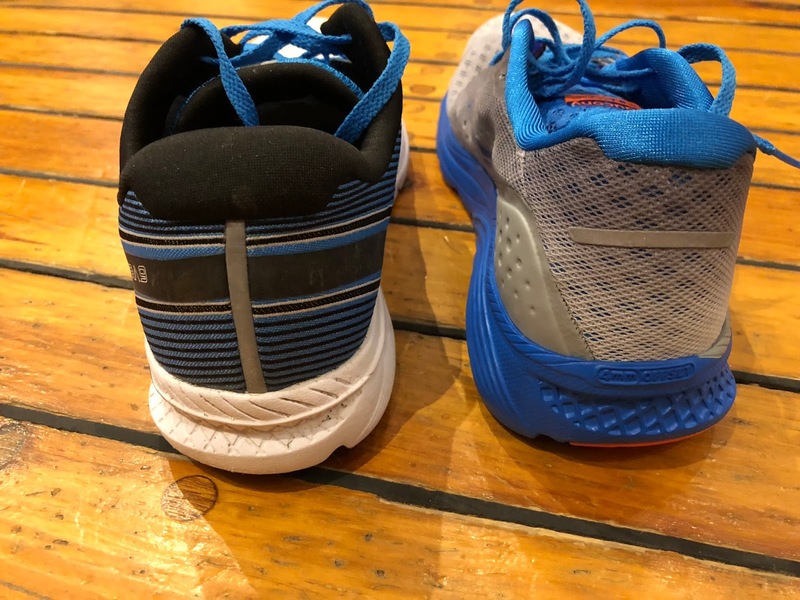 sorry I didn't add this to my comment on the other shoe but the mechanics of the K9 & the Brooks Pureflow seem to be exact measure for measure - just looking for that drop more cushion. Tried the Ride and felt like my foot was falling asleep after 2mi - thought would get over it but the tingle stayed. Afraid to run in high heels and go for a higher heel drop than the Neuro or Mazama keeping the drop relative from 4 to 6 - or is this a better substitute? My mileage is 3-8 per run every other day & longest being a half. I am a mid foot striker and not really putting pressure on the heel. Coming off a NB Minimus - that one really felt like I was slapping the pavement... so K9, Neuro or Mazama? just couldn't get a read on ventilation. Thnx! Of the 3 you mention I would select K9 and even better the K10 coming soon, next month or so which has a yet better fitting upper and a smoother ride and transition than 9. Mazama is a trail shoe. I haven't run it but you will find our review below. Neuro is OK but not one of my favorites. Coming off Minimus you might also look at Altra, for example Escalante, zero drop or the excellent NB Beacon or one of the Salomon Sonic RA, such as Sonic RA or Sonic RA Pro. Reviews of all of the above below. Thanks for reading.